For our final meal in Vegas, I wanted to go somewhere a little off the beaten path – at least, off of the beaten Strip path. After we checked out of the hotel and got everything together, we headed over to this little strip mall just a couple of miles away from the Las Vegas Strip. My cohorts were pretty skeptical about this one. Food inside of a beauty salon? Is that even healthy? The fact that it’s in a beauty salon just intrigued me more. I love weird, quirky places and this totally fit the bill! I ignored their weird looks and trusted my gut that this place would be awesome. Luckily my friends trust me as well and I heard no protests. The owner/chef has got his little corner in the beauty salon, complete with tiled roof and little string of lanterns. I was already in love with this place. The owner is originally from Los Angeles and made his way out east to Vegas (I think because his wife is from Vegas – but don’t quote me on that). He originally had a food truck, but set up shop here after seeing a place for rent in Craigslist. I swear, you can find just about anything on Craiglist! Used TV’s, free chairs, moving boxes, boyfriends, and apparently, places to rent so you can make and sell your little steamed bun sandwiches. The menu here is pretty simple. 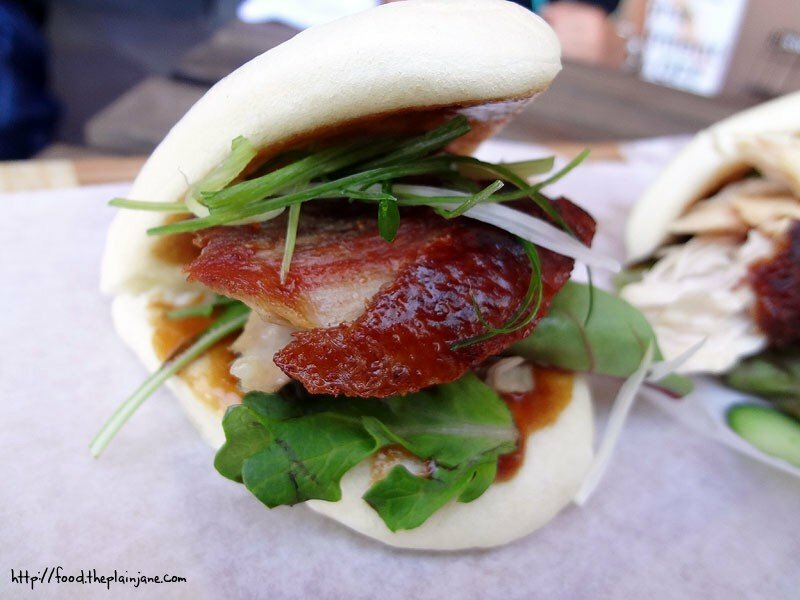 All of the sandwiches are made with bao which uses similar ingredients to bread, but the bao is steamed, giving it a soft, chewy consistency. There are five different fillings for the Bao (one of them, the pulled pork, isn’t up on the menu). There are smoothies and salads plus cold and hot drinks. The best deal – the deal that all of us got – was three bao + a drink for $10. For an extra fee, you can upgrade to a smoothie. All of us got iced tea as our drink of choice. The really nice thing about that was we could have it sweetened how we wanted it. Laura got it unsweetened, I got it slightly sweet, and Jake and Chris both got it sweet. There was a bit of wait for our sandwiches – but that was totally understandable, seeing as this was a one man job that day. We waited outside for our food since it was about the only place where all four of us could sit together. There are two very small two seater tables inside and two tables outside. Everyone got a little cutting board with their bao sandwiches on it. I choose the duck, chicken and pork belly sandwiches. 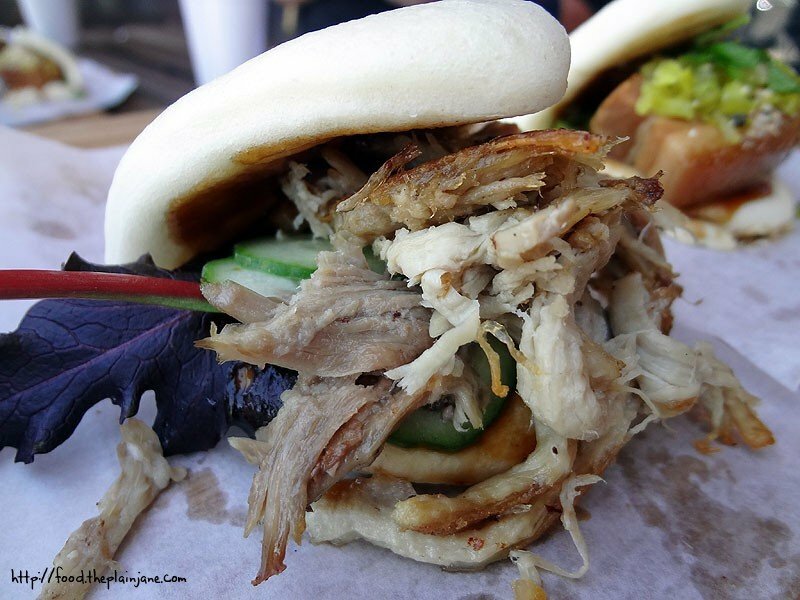 This is the pulled pork bao. I didn’t actually try this one, but this is Jake’s. Each little sandwich that different toppings and sauces. Sadly I can’t remember what they all were, I just remember it was all super delicious. The duck bao was very tasty – the duck was cooked nice and the skin was slightly crisp (it would have been super awesome if it was really, really crispy, but it was still good). The duck was tender and their was a sweet sauce put on the bottom of the bun. The freshly steamed bao was moist with a slight chew and I devoured this pretty quickly. 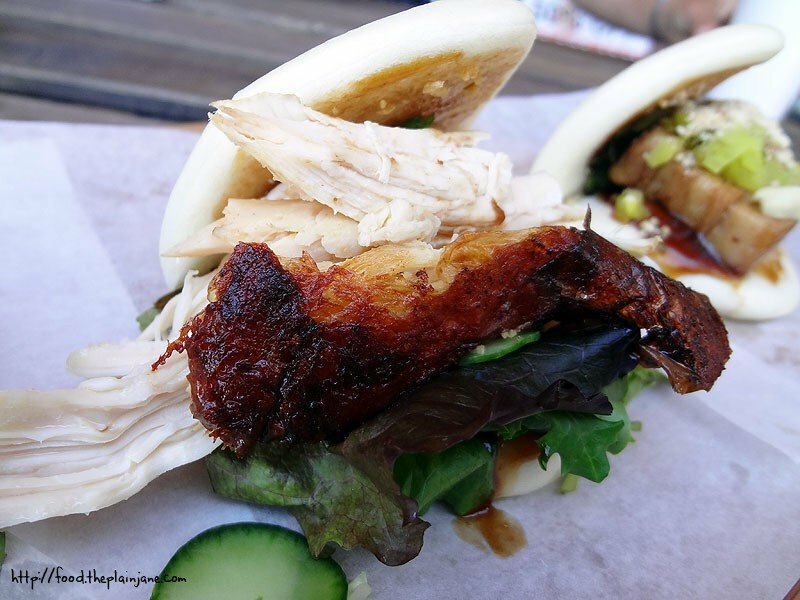 The chicken bao sandwich used breast meat and the skin was very crisp, making me a happy girl. There was a little bed of greens on the bottom and a different sweet sauce was put on this one. The chicken was moist and tender, making for another excellent little sandwich. This flavorful little sandwich has got a nice, thick piece of pork belly, another sweet sauce, sauteed celery and crushed peanuts. The pork belly isn’t crispy – minor sadness – but it is very tender and full of porky flavor. This one really melted away in my mouth, with the tender pork belly and the soft bread. Very delicious! All four of us were pretty quiet as we devoured our little sandwiches. I think the only complaint here was that we all wished we had just one more sandwich to eat. This visit inspired me to try more off-Strip locations the next time we come to Vegas – there’s so much to see and do in such a large city, it’s a shame we spend the majority of our time on the Strip. Be adventurous, too, and find something off the beaten path! Sidenote: I just read on their website that they will no longer be in the beauty salon as of July 16th, 2012 and will be looking for a new spot to sell their delicious sandwiches. So glad we got to try it and hopefully they will have a new spot very soon! 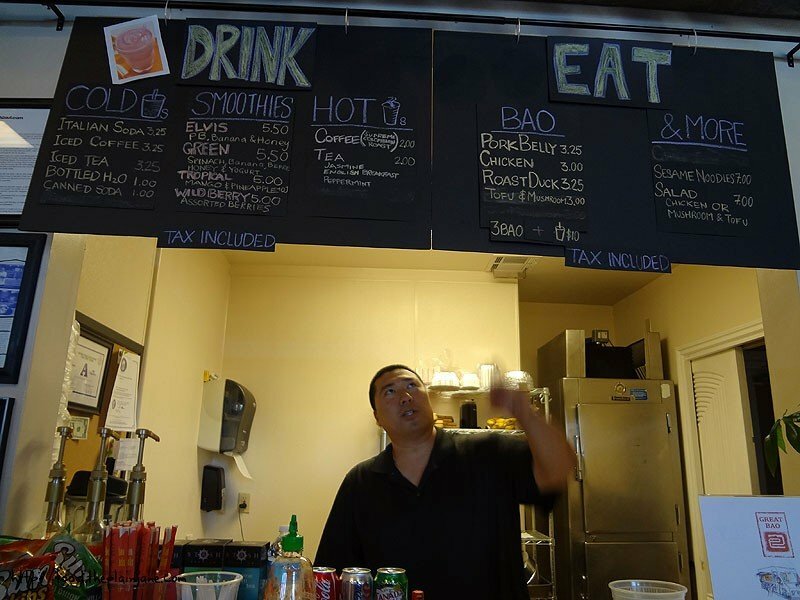 Check out their website for updates for their new location and for their food truck’s locations! I didn’t realize the place was IN the salon! When I was looking it up, I thought it was next to the salon. Those buns look so good! Better than the ones we had at Bacchi Burger (it was on DD&D and my parents love it). 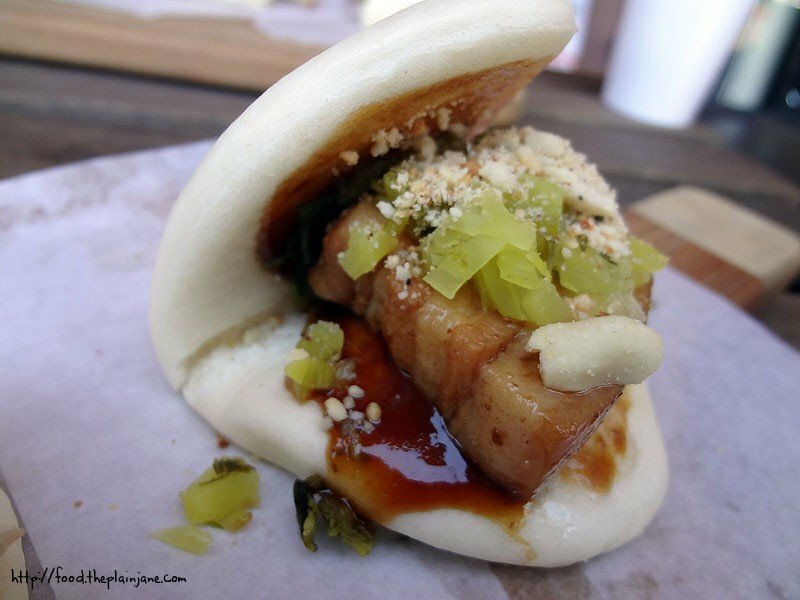 Next time we’re in Vegas, I’m going to go find Great Bao! Oh this place looks good! I love that it’s in a salon. Though I guess it will be good for business for them to move out of it. heh. Too bad I can’t visit before they move out. How did you hear about this place? I was just in Vegas last week, and would have loved to try it out. Next trip! Hi Leanne – Yup, totally inside! It’s probably for the best they’re going to moving, to hopefully a larger location. I hope they have a new place set up by the time I’m out there again. Hi Kirbie – It was definitely one of the most unique locations I’ve ever seen for a food shop! Hi Sandy – I found it on yelp – doing a search for “quirky restaurants” – it was the very first listing! great minds think alike, heh heh. the things we do in our search for quirky eats! i like how each sandwich was diff’t. what a great deal that was. if we ever go to vegas, we will totally check this place out! I enjoy your very detail and descriptive blog; it’s amazing that one’s curiosity can come across the little sandwich shop in the middle of odd shopping strip. 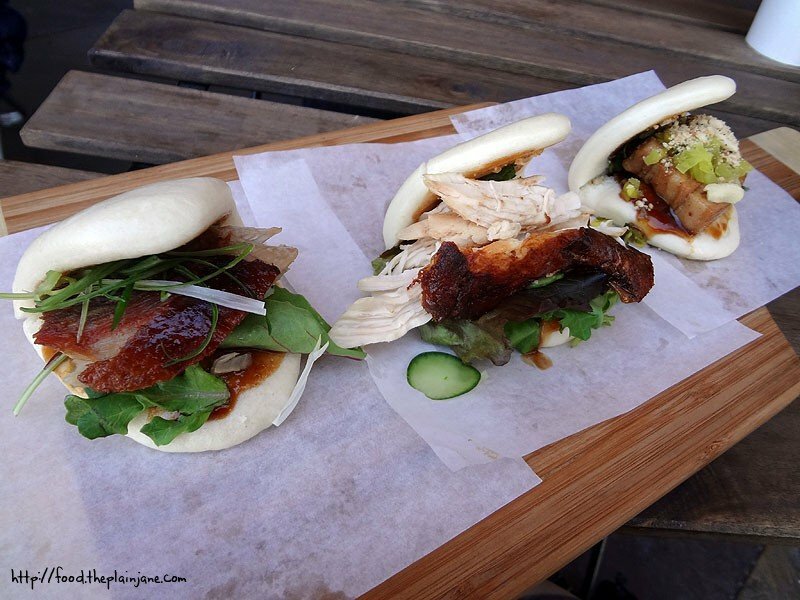 The photos along with a detail paragraph of each bao were both eye pleasing and mouth watering. 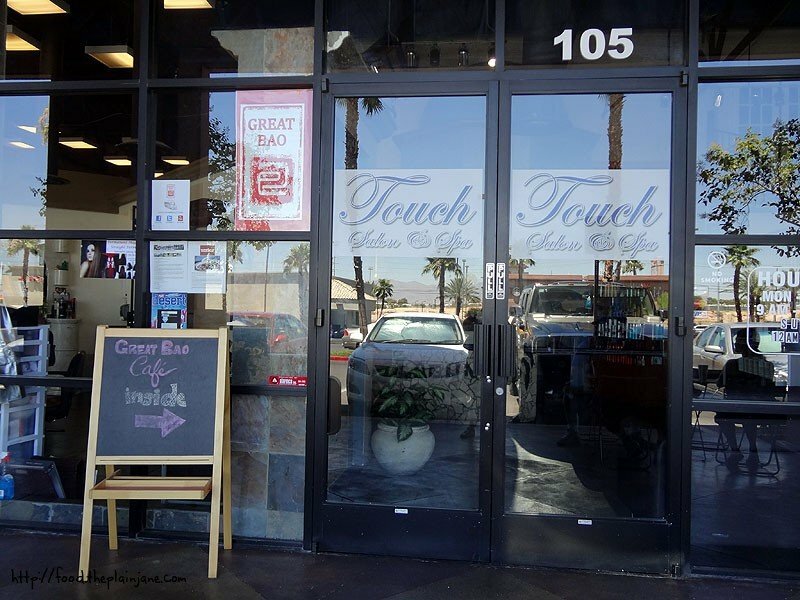 The back story with the owner and how his business was setup in a salon store was interesting. I wish you could follow up with the owner and if he plans to expand his bao shop in different city or will it be exclusive in Las Vegas? I wished you could’ve reviewed the other bao sandwich rather than tasting only one and which bao was your favorite? I find your outline to be great format to follow; it’s very helpful to grabbing audience’s attention and their stomach. It’s great that you ignore what you eyes see and went with your gut feeling and to be rewarded with a delicious treat. 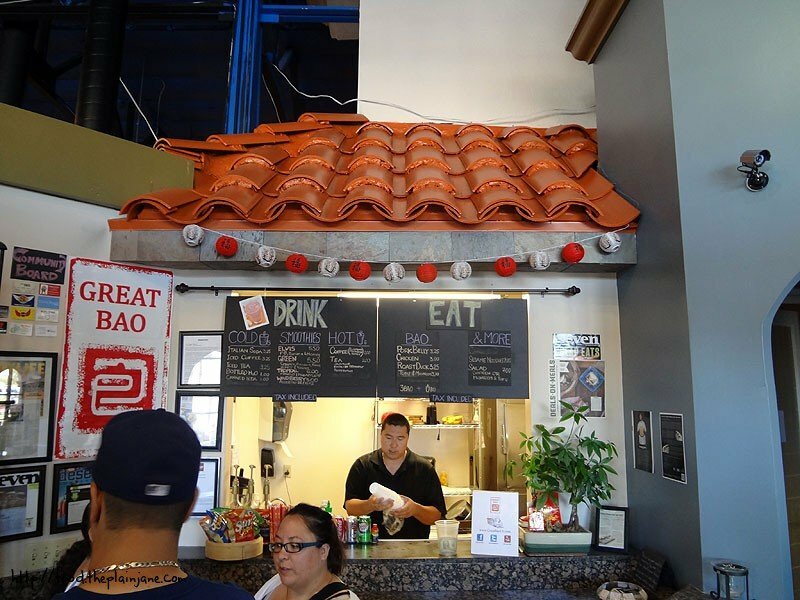 I hope there’s a bao shop like that in Southern California or something similar to that. You have just made a follower to your blog and I hope to read more of your tasty adventures. Hi Ryan – Thanks for your comments! I wish I could have tried other Bao shops, too, but we were limited on time and this was the only one we tried. My favorite of the three I tried was either the pork belly or the chicken… the chicken had a really nice, crispy skin on it that I loved. Hope you continue to enjoy my other adventures and that you share your thoughts with me! It is a pity it is moving out of the hair salon, would be such an original and quirky setup but i suppose booming business would dictate a move into larger premises. Definitely on my list for next trip to LV. I love Great Bao! My favorite was also the pork belly. Thanks for the update regarding them closing, so I can also update my entry. I read it was because the salon was recently sold and the new owner’s won’t honor their lease for the space. They relaunched their food truck and hopefully will be getting a new space soon. Can’t wait to go back and check out their new spot though. Hi Jenny – I loved this place when I went so I was so sad to hear that they were getting kicked out. What a bummer! Hopefully they are set up shop in a better location by the time I visit Vegas again.